One of my sisters came to visit. She had a rough flight from Philly to Munich. Followed by a two hour delay in the Munich airport due to snow – a total of 6 hours sitting in the airport. We didn’t do much Wednesday night. We had a quick dinner of soup and salad, and then she was off to bed. Yesterday was fun though! After a leisurely morning – a breakfast of Turkish egg salad, gozleme, olives, feta, and more – followed by 30 minutes of the massage bed, we went for a walk through the neighborhood. We stopped at the shops along Guvenlik Cad. Then we had a lunch of Adana Kebap and Lamacun. This was followed by tea and baklava at home. At that point we needed a nap! In the late afternoon, I took her to the pazar in 100.Yil. We enjoyed the atmosphere of men yelling “Abla” (big sister) at us as they tried to force their fruits and vegetables on us. 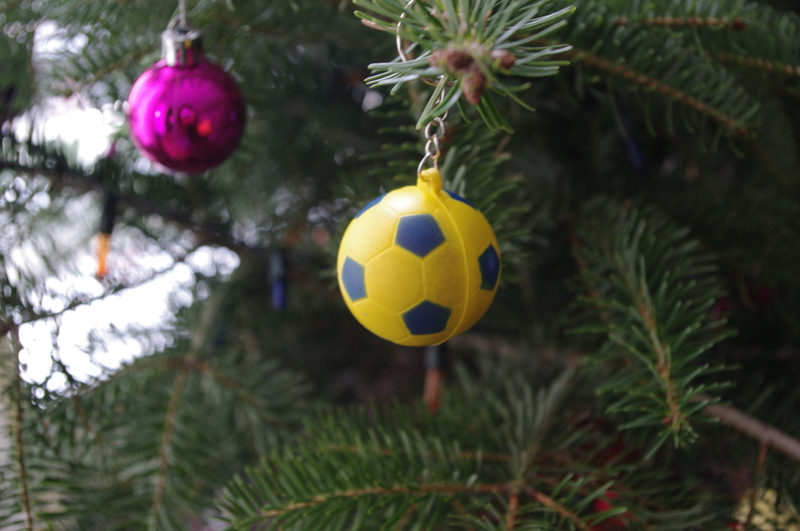 We bought a few things, including a keychain with a dangling soccer ball to hang on our Christmas tree. I thought that would make my husband very happy. Unfortunately, it was yellow and blue, the colors of the Fenerbahce team! Oops! Wrong team. The most enjoyable part of the evening was introducing Abla to my husband’s parents. My mother-in-law was particularly excited to welcome Abla to her home. She kept saying that she was very happy and she loved her, in both Turkish and English. Turks are extremely welcoming. Anne (mom) cooked a huge meal for us. We had soup with small balls of bulgar, salad, another salad with potatoes, carrots, and peas, deep-fried bulgur balls stuffed with ground beef, a beef roll-up stuffed with potatoes, home-made pickles and more! Dinner was followed by home-made rice pudding and tea. Even more fun was that neighbors kept ringing the bell and dropping off Aşure pudding. This is a traditional dessert made most often on December 16th, the day that is recognized as the day that Noah landed his Ark on what is now known as Mount Ararat. 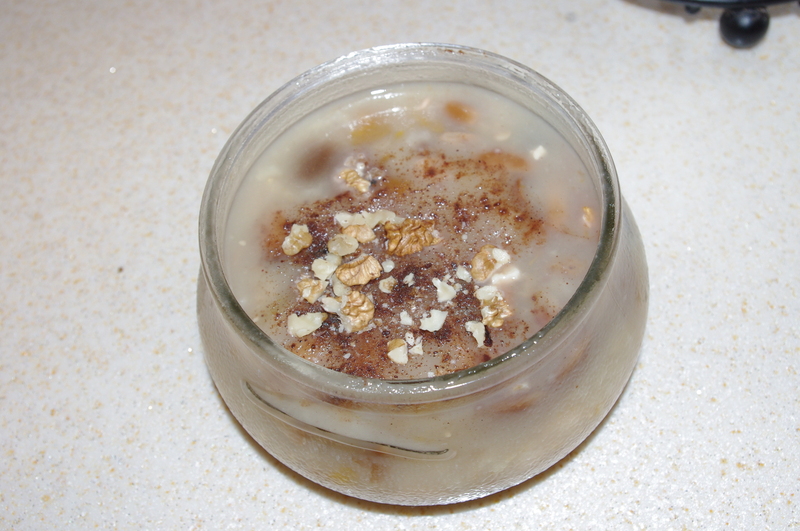 The pudding, while sweet, is made of what was allegedly the only food ingredients left on the Ark – kidney beans, white beans, chick peas, some kind of wheat grain, raisins, figs, nuts, and other things that seem extremely odd for a dessert. I know it sounds gross, but it is really really yummy! After dessert, there was the usual following of more tea and mixed nuts. Anne was not too happy that we left without having fruit. But geez, it was already 10pm and the hubby had to go to work in the morning. It’s also funny how Americans don’t eat fruit before bedtime because of the acid and Turks eat it to settle their stomachs before sleeping. Anne did manage to send us home with bags full of left-overs and lots of other goodies! So what next?? The Turkish-American society today to partake in the English conversation class for Turkish ladies. They love having native speakers. Then we will head to Kizilay for shopping! Capadoccia this weekend!!! Have a great time with your “Alba”. It certainly is nice that you can show her a whole new culture! Can you email me the dessert recipe’s? Thanks if you can, if not that’s ok too. Tell Patty we miss her. I am so glad you joined our English conversation group .Having a native speaker makes a big difference !!! Merry Christmas and a happy new year…..